Sommerberg.org | Sommerberg Hotel Bad Wildbad, Herzlich Willkommen im Panoramahotel über dem Enztal! Powder snow piled high on the tree branches was cascading down in the early morning sunshine today. After weeks of zero temperatures and little sunshine there is no shortage of snow. 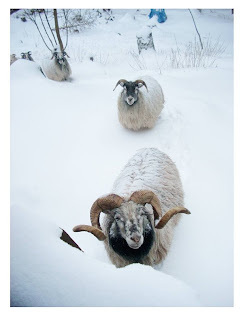 Meanwhile Rambo the ram and his flock continue to wade through deep snow each morning for their daily feed, unruffled by the extreme weather. These icicles hanging from the Sommerberg hotel conservatory were photographed a couple of weeks ago at dawn. Some were several meters long but many have since disappeared due to a short warm spell.